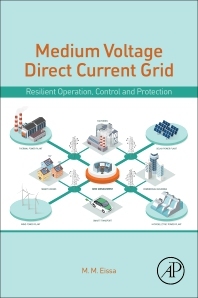 Medium Voltage Direct Current Grid is the first comprehensive reference to provide advanced methods and best practices with case studies to Medium Voltage Direct Current Grid (MVDC) for Resilience Operation, Protection and Control. It also provides technical details to tackle emerging challenges, and discuss knowledge and best practices about Modeling and Operation, Energy management of MVDC grid, MVDC Grid Protection, Power quality management of MVDC grid, Power quality analysis and control methods, AC/DC, DC/DC modular power converter, Renewable energy applications and Energy storage technologies. In addition, includes support to end users to integrate their systems to smart grid. Industry for renewable energy technology providers; smart grid consulting firms, utilities, and researchers in power systems; Modeling and Operation Engineers, Energy management Engineers, and Protection, power and Power quality management Engineers; energy generation, energy conservation, utilities, end-users, Industrials etc. M. M. Eissa (M’96–SM’01) was born in Helwan, Cairo, Egypt, on May 17, 1963. He received the B.Sc. and M.Sc. degrees in electrical engineering from Helwan University, Cairo, in 1986 and 1992, respectively, and the Ph.D. degree from the Research Institute for Measurements and Computing Techniques. Hungarian Academy of Science Budapest, Hungary, in 1997 (PhD Study is cooperated with Duisburg University-Institute of Electrical Engineering-GERMANY). Currently, he is a Professor with Helwan University. In 1999, he was invited to be a Visiting Research Fellow at the University of Calgary, Calgary, AB, Canada. He was a chair Prof. at King Abdul-Aziz University-KSA for sponsored project "Demand Side Management and Energy Efficiency" from Saudi Electricity Company during period 2008-2010. From 2012, he is the PI for the large scale project "SMART GRID FREQUENCY MONITORING NETWORK (FNET) ARCHITECTURE AND APPLICATIONS-220kV/500kV" NTRA-Egypt (www.helwan-ntra.com)-2012, END-USER Egyptian Electricity Company. From 2013, he is the PI for "NOVEL OPTIMAL WIDE AREA COORDINATING PROTECTION AND CONTROL SYSTEM BASED ON WIDE-AREA SYNCHRONIZED MEASUREMENTS IN SYSTEMS WITH RENEWABLE ENERGY RESOURCES AND MULTIPLE FACTS EFFECT", KACST-KSA, End-USER Saudi Electricity Company.